It was Trevor who first started an Awakin Circle in Detroit. Many locals joined, including Sateen. Then, when I got bit with the ServiceSpace bug of "small acts of kindness", and especially when my son went on two year Peace Corps fellowship to China, I started to host it. It's been 3.5 years since we've hosted Wednesdays every week, and it's changed our life. And Trevor continues to join every week (Sateen moved to DC). As our local connections deepen, we also want to step things up. We did local events, hosted people like Nimo, tried suspended coffee, and most recently have been trying to get Karma Kitchen started. Restaurants somehow seem quite skeptical, but then, we found an answer in one of the original Awakin Circle hosts with Trevor -- Mieko. Back in 2011, Mieko started cooking out of a "Pink Flamingo" airstream trailer on Thursdays, using produce from a local farm. She called it Guerrilla Food, "to evoke the concept of using food as a tool for resistance: against the corporate ownership of food and against societal and individual illness. However, the double entendre lends itself well to parts of my mission too. Gorillas are massive yet gentle animals who lead peaceful family-centered lives and survive off a completely vegetarian diet." In short, Food as Medicine. And every Thursday, people can find medicine of love near a community park, hosted in the back of one of those infamous empty homes of Detroit. 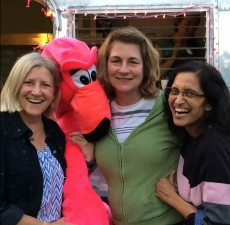 So we recently tried an ad-hoc Karma Kitchen there -- at the Pink Flamingo. (Thank you, Sima and Audrey, for helping envision it!) Few of us volunteered to help Mieko and we offered some initial money so she can surprise her guests at the time of the meal. Because we were volunteering, we got to see everyone's response -- "Paid for ME? Really? Can I pay forward too?" In fact, practically everyone organically just wanted to pay it forward. So at the end of the day, the money we had given to Mieko is still there! So now, we're thinking of expanding this with our group of volunteers -- and create a whole dining experience in the park, with some of our own hand-cooked meals, some of our hand-made art that we would gift to guests at the end of the meal, and lots of things like Smile Cards and Decks in between. Will keep you posted as more stories happen. Last night was the first time I got to visit Awakin Santa Clara -- a long time dream of mine -- and I'm still buzzing from my expanded heart. Thank you for the inspiration!